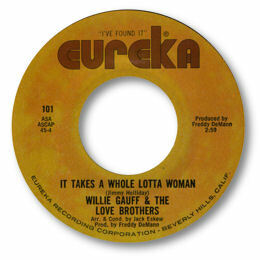 West Coast artist Gauff and the Love Brothers (Kind Brothers on Eureka) only cut three 45s but they were all so full of righteous fire they must have come from the gospel scene – and may well have gone back there. Every single contained a real gem of a side. Their Kent 45 Whenever I Can’t Sleep is outstanding – great harmonies and a fiery lead over a crack LA band with fine horn support. The sermonette in the middle section is excellently well judged and you can just hear another of the guys encouraging Willie as he raps on. The unissued Kent recording Farewell is a simply awesome deep soul ballad. No frills like horns or strings just a small rhythm section behind some of the most intense secular singing you’ll ever hear. Love the second vocalist’s interjections throughout – just makes the whole song come alive. The Eureka 45 is the most celebrated – and the fuller production may well just make it the best of the 45s they cut. It Takes A Whole Lot Of Woman was also cut of course by Jerry Combs and while Combs was magnificent in the way he approached the boastful lyric Willie Gauff and the boys raise it to whole new level. Wonderful Jimmy Holiday number. The Watts Way 45 is easily the most difficult to find but what a treat if/when you do. It Hurt So Bad is another masterful demonstration of hard vocalising with Willie’s screams being particularly effective. There’s a meandering tenor sax adding some tonal colour but the low fi production values can’t disguise just what a brilliant 45 this is. There was a time when music of this intensity was considered a commercial proposition – and it’s no good imagining that it will ever happen again. 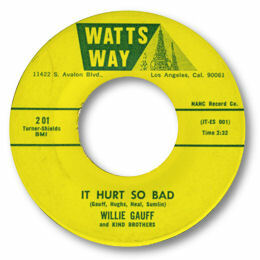 But listening to Willie Gauff it’s no wonder that I – and many other fans of real soul music – live their lives in the past. Note ~ “Whenever I can't sleep” and “Farewell” can be found on the Kent UK CD “Slow ‘N’ Moody Black & Bluesy” (CDKEND 003). Thanks to "Ian" for info on the recording dates now included in the discography.